Don’t Allow Flies to spoil your business! Your Professional Account Manager will customize a program using an integrated pest management approach for your facility that will give you the best possible control. We will use a combination of exclusion, good housekeeping practices, good sanitation, eradication, and monitoring to ensure that your facility is kept under control. We have a wide variety of programs using chemical and non-chemical methods tailored to each facility. The Slimline fly light trap is an attractive wall mounted fly light that is perfect for restaurants, supermarkets, hospitals, food manufacturing plants, office buildings, deli’s and bakeries and more. The trap is only three inches in depth, which makes it perfect for confined areas where crowding is a concern. A black panel hides captured insects from view in sensitive areas. Bulbs should be replaced every 6 months to be most effective. Glue boards should be changed every 30-60 days. Glue boards may need to be changed more often in high infestation areas. Easy Off Grate for Fast Servicing. Convenient Insect Catch Tray for Easy Cleaning. Stands on a Counter or Mounts on the Wall. Extra Long 6 Foot Cord for Extra Placement Flexibility. Exclusive 15W, 18″ Shatterproof UV Reflector Tubes Attract flies covering an area up to 1500 sq. ft. The WS-85 wall sconce is a decorative Gold Vein, or White wall mount light trap. The stylish design combines a V-Shape wall conce light and an adhesive board. 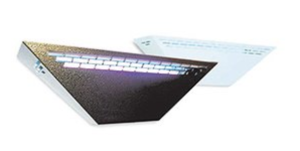 Flying insects are attracted to the ultraviolet light and captured on a replacable adhesive board inside the sconce. Position 5-6 feet above the floor. This light is perfect for dining rooms where being discreet is important. UL Approved and easy to use. Just plug into any 110v outlet. No tools required. 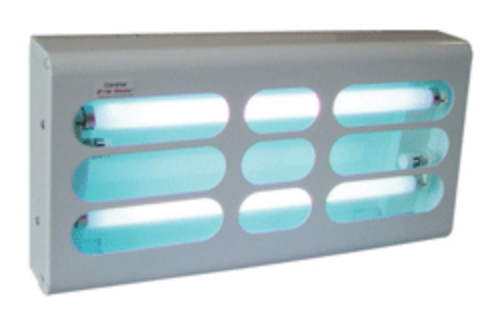 Insect Light Traps (ILT’s) are an important non-insecticidal method to control flying insects. ILT’s attract flying insects by using Ultra-Violet light. Flying insects are drawn by the U.V. light and are either trapped on adhesive glue panels or electrocuted on an electrified grid. ILT’s work 24-hours a day, seven days a week. ILT’s catch a variety of flying insects including house flies, bottle flies, yellow jackets, moths and beetles that contaminate food, affect our health, and are irritating. ILT’s are the best continuous tool for flying insect control, working 24- hours a day, 365 days a year. The Luralite Professional is a very discreet insect control unit, designed to look like an attractive wall light or uplight. However, it is twice the size and power with two 15 Watt bulbs that produces UV light which attracts mosquitoes, flies, and other flying insects to the unit, and the pre-formed pheremone impregnated glue pad simply fits inside the unit and captures these insects leaving them helpless, in a “sticky” situation. The unit is installed to a wall via the supplied mounting hardware, ideally in the darkest place free from windows and skylights and approx. 6 feet from the ground. Once mounted, the special back plate ensures that the UV light is not directed to the wall to damage any color or pattern. 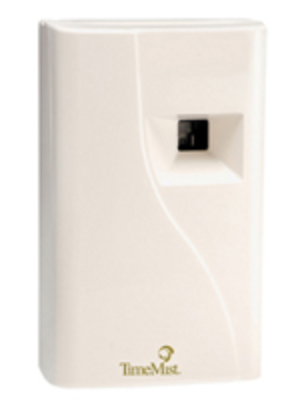 The Luralite is available in White only, but still provides 24 hour insect control. The unit covers 540 sq. ft. and is ideal for public and commercial areas such as hospitals, restaurants, and other indoor uses. 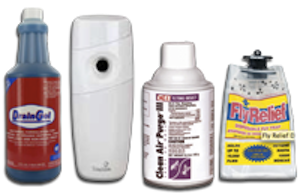 Time Mist Metered Aerosol Dispensers are a great way to keep the flies from entering the doors of your home or business. We install the unit with a can of Purge III which takes care of all flies, mosquitoes, and gnats that are hovering around the entrance doors. The metered dispenser will automatically put off a burst of spray every 15 minutes and can drastically reduce the amount of flies hovering around the entrance to your home or business. For more information, give our office a call at 877.232.3055. 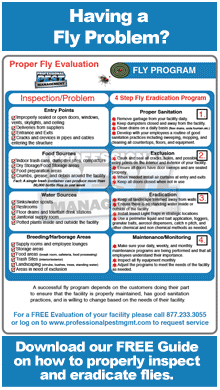 There is a wide variety of methods we can use on your facility to rid you flies. See your Account Manager for more details on the methods that could be used that best fit your facility. The most important part of any fly program is monitoring the equipment and treatments as often as necessary. 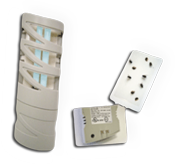 All Insect Light Traps are checked monthly and glue boards are replaced. All bulbs are replaced every 6 months or earlier as necessary to ensure proper luminocity. Inspection of all light traps or other mechanical devices on the facility as well as replacement of traps in areas of activity. Proper evaluation each service to ensure that placement needs haven’t changed, and whether or not alternate methods or additional equipment is needed.